Rain, strong winds, cold fronts and heat waves mixed with lengthy treks across campus all force the average Tech student to strongly consider take some sort of transportation. Whether that is in the daytime with the trolley and stinger routes or at night with Midnight Rambler and the Stingerette vans, the various vehicles play a vital role in connecting students with points in and around campus, and over the years, the transportation has evolved to meet the demands with a growing campus. “I’ve been here 10 years. The system that you see in operation right now was pretty much in place three to four months before I got here,” David Williamson, the Associate Director for Parking and Transportation at Tech, said. 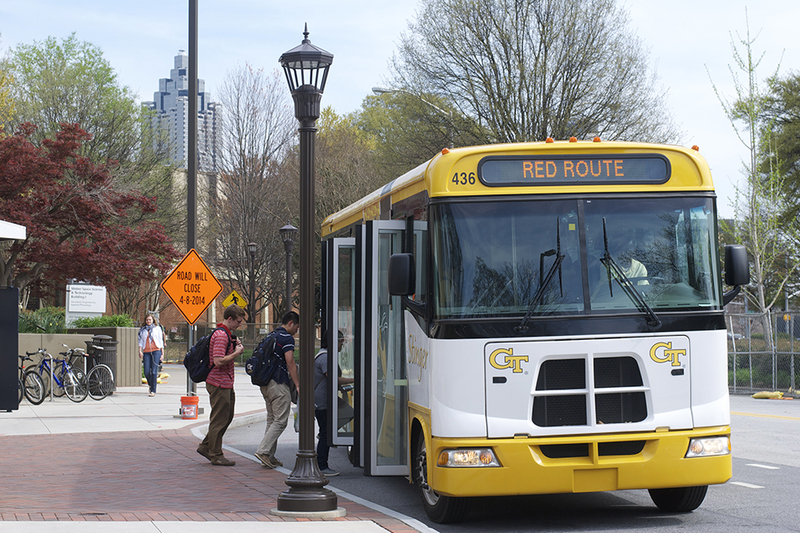 Though the system may not have changed, a lot of the actual routing has evolved with campus, most notably with the trolley when Tech Square opened in 2003. In addition to serving Tech Square, there were discussions on furthering the stops of the Tech trolley to better serve the students. Not only did Parking and Transportation include MARTA as a stop, but from talks with student government, they also starting serving Publix. “Prior to that, the trolley would loop back up to 10th street then come back down Spring Street, basically so that the trolley was following the signals. We had a little bit of concern there because there was no light, but we did it, and it seems to be working okay,” Williamson said. On the contrary, the red and blue routes have remained rather consistent with their original mapping, aside from the incorporation of the North Avenue stop. With routing, Parking and Transportation takes two main factors into consideration when scheduling the number of vehicles. For the green route, we don’t want anything less than 20 minutes. Regardless of the number of people, it could be lightly utilized, but we at least want a minimum of 20 minutes,” Williamson said. However, with the red, blue, and trolley routes, schedules mainly depend on the users, or ridership. “Those routes are the ones that create the demand. Routership levels on the trolley require six trolleys during the daylight hours. The reds and the blues will be running four each just because of the heavy routership,” Williamson said. As the times have changed, Parking and Transportation has kept a close eye on the volume of students and noticed a growing percentage of students needing transportation late at night. The increased student demand for a fifth route is what resulted in the Midnight Rambler; however, the road to getting the Rambler had its share of financial troubles. Parking and Transportation responded by making concessions to accommodate both the existing routes and to introduce the Rambler. Currently, Parking and Transportation is dealing with the re-routing of the three bus services due to the closing of Cherry Street and Ferst Drive for construction on the steam lines. “The trolley will essentially stay the same. We’ve had to shift the rest of the operations out onto Tech Parkway. People have been very supportive in helping us do that. A lot of the folks in construction and GTPD have been helping. It has a big impact on our users, but we’ve had a lot of support. We’re going to be watching it really closely and see if we have to adjust something, we will,” Williamson said. In regards to the 2014-2015 academic year, Tech Transportation looks to continue providing services just as they have to members of the Tech community, as their budget will remain roughly equivalent to this year. The transportation system is made up of 50 employees and includes eight trolleys, 16 stingers, and five Stingerette vans. Sometimes it’s a policy decision. For the green route, we don’t want anything less than twenty minutes. Regardless of the number of people, it could be lightly utilized, but we at least want a minimum of twenty minutes,” Williamson said.